I think of the word ratchet like a friend you graciously let stay on your couch: it was cool at the beginning, but it’s really overstayed its welcome by about a year. The first time I heard the word was in a 2009 song by Hurricane Chris called “Halle Berry (She Fine),” where the rapper drones, “Well, let’s get ratcheeet, let’s get ratchet!” I didn’t know it at the time, but ratchet was originally a genre of crunk rap music local to Shreveport, Louisiana, where Hurricane Chris originates. My first reaction was, “What does ratchet mean? !” But the answer I would have received then is not the answer I’d get in 2013. Ratchet has flown far from the swamps of Shreveport into its own murky national definition. The word has adopted the negative class implications of ‘ghetto’; in fact, I think ratchet has deep-sixed ghetto out of popular black vernacular. But ratchet/ratchetness also occupies a unique space in black culture. On Facebook, I see old college friends assign their love for the Basketball Wives or Love and Hip-Hop franchises to their ‘ratchet sides,’ or conversations dubbed “sophistiratchet.” In this sense, the word connotes a low-brow factor to entertainment. Young black people still want to have a ‘ratchet side’ while maintaining an air of polish (i.e. code switching). It was okay to be ratchet until the Twerk Heard ‘Round the World at the VMAs. All of a sudden, I saw people distance themselves. “Oh, Miley Cyrus only imitated the ratchet part of black culture,” “Twerking isn’t blackness,” “Only ratchet women twerk anyway; it’s disgusting!” As if twerking was never done by anyone with a degree. The respectability police came out with batons, beating down the image of ratchetness as antithetical to black progress. My problem with this stems from the spectator sport that occurs when people engage in a culture but place themselves above it. Yeah, I watch twerk videos on WorldStar, but I’m not like those ratchets! Or: Yes, I twerk/rap, but I’m white and can go back to ‘normal’ at any time. 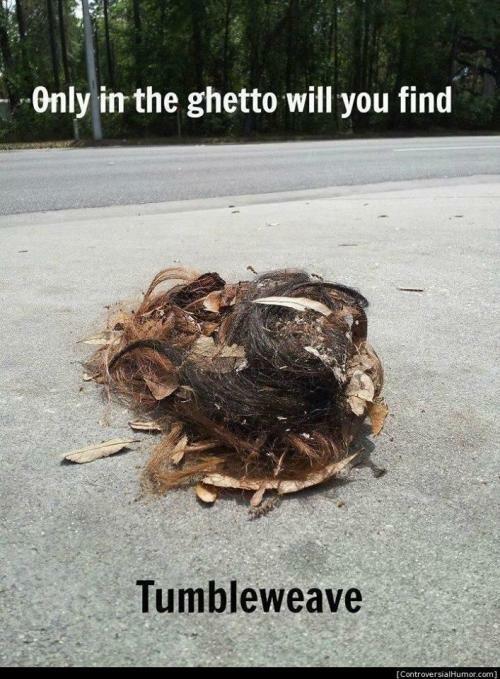 Patently untrue; I have found tumbleweave in the suburbs! Exhibit A: Ratchet class bias. Much has been said lately about respectability politics, which posit that black people can improve their lot in life by just cleaning up their image. Tricky. Certainly, not twerking or sagging your pants in public may help society think better of you, but it doesn’t mean they will treat you better. I advocate for people to be the best they can be regardless. I realized recently that what I want is white privilege. No one made parallels linking Miley Cyrus’ teddy bear onesie stunt to the future of white American tweenyboppers. But I had vehement debates with friends about whether or not the questionable activities of some black people will sink the entire race. Will our collective negative image to white America be our communal downfall? I want the liberty for some black people to be mediocre, if they so choose. I want there to be wine-up dance videos on YouTube and Essence spreads on Shonda Rimes because black folk are not a monolith and we deserve the right to be human, not 100% model minority figures. Because the truth of it is this: If Martin Luther King, Jr. was not enough, if Paul Robeson was not enough, if Toni Morrison was not enough, if Frederick Douglass was not enough, if Mary MacLeod Bethune was not enough to prove that black people are worthy of dignified treatment (by the logic of respectability politics), we will never end racism. Reblogged this on Electric Relaxation. Reblogged this on Expatriate Games. Bethany sent me here and this is lovely. And hard. And lovely. Thank you. Ma’am…if that last paragraph aint the whole truth. Thank you! I don’t know how many more respectable race reps we need! 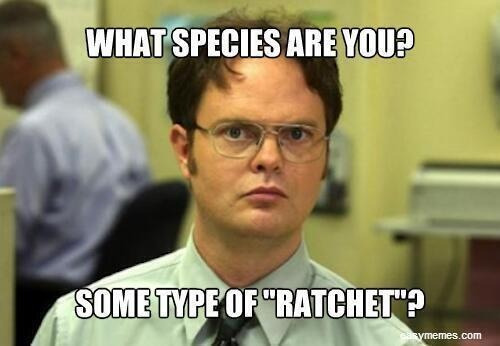 Rachet is a personality trait that can be labeled to any ethnic group, who desire to be rachet and not progress. One can better themselve by modeling positive behavior, thus leading to a higher socioeconomic status. We all are a reflection of our environment. It remains up to an individual, who he or she wants to identify with.